Taste the the real life of a Musher and join experienced mushers on an expedition in the arctic wilderness. 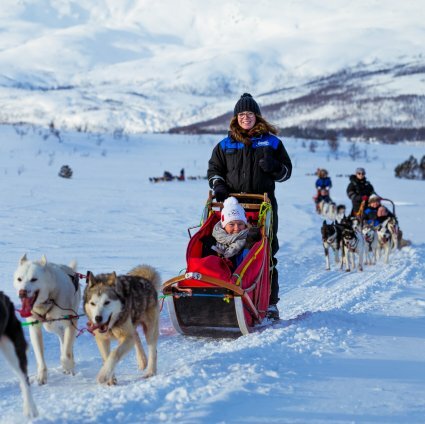 You will prepare and drive your own team of Alaskan huskies for approximately 6 hours, and get to enjoy the North-Norwegian nature. No former experience with dog sledding is required, you will learn from the experienced guides as you go. Food and all equipment are included. When returning to the camp you will be served a traditional Sami meal called “Bidos”, reindeer meat with vegetables. This will be served in a heated lavvo, a Sami tent. A full day of dog sledding will most likely give you a memory for a lifetime and a proper polar winter experience. Child conditions: This excursion is not suitable for children under the age of 16. Included: Warm clothes (overalls, boots) and equipment, transfer and hot meal. Special conditions: The expedition requires good physical condition. Minimum 2 participants. If travelling alone you can still book this add-on as there might be other travelers participating. Weather dependent:All outdoor activities are weather dependent and may be cancelled or replaced by more suitable alternatives should the conditions not permit to run the tour as planned. A full refund will be made for activities cancelled by the supplier due to weather conditions.